Special Offers from Discount School Supply®! : On a Budget? Check the Clearance Center! On a Budget? Check the Clearance Center! Ah, budgets. Wouldn't life be grand if we didn't have to worry about budgets? Thankfully, the Clearance Center at Discount School Supply allows you to shop for the best early learning educational materials without worrying about your budget. 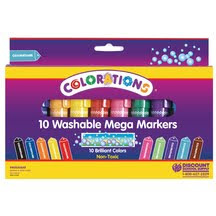 Colorations® Super Washable Mega Markers - Set of 10 ONLY $4.49. International Tabletop Blocks - Set of 34 ONLY $29.64. Wooden Construction Vehicles - Set of 4 ONLY $12.95. 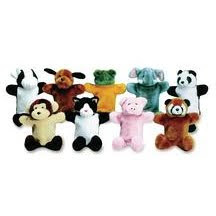 Set of 9 Super Plush Washable Animal Hand Puppets with Feet ONLY $ 22.99. Plus, there's so much more! Click here right now to go to the Discount School Supply Clearance Center and see for yourself! Find the 110% lowest prices guaranteed on Arts and Crafts, Manipulatives, Curriculum Resources, Active or Dramatic Play items and Furniture exclusively at Discount School Supply. Also, shop Discount School Supply for more great deals for Infants and Toddlers, as well as learners with Special Needs. Discount School Supply is THE place to shop for your early learners, particularly if you are on a budget. In fact, when you shop the Clearance Center at Discount School Supply, you'll be even more amazed at how far your budget will go! So what are you waiting for? Click here right now to go the Discount School Supply Clearance Center! 20% Savings - One Week Only! The Vario Seat Makes Other Trikes Obsolete! How Far Does $20 Go at Discount School Supply?